You made a great black and white out off this Hien! She is a beauty, Hien! She looks good in black and white, very nice! Oh those wet snows…. 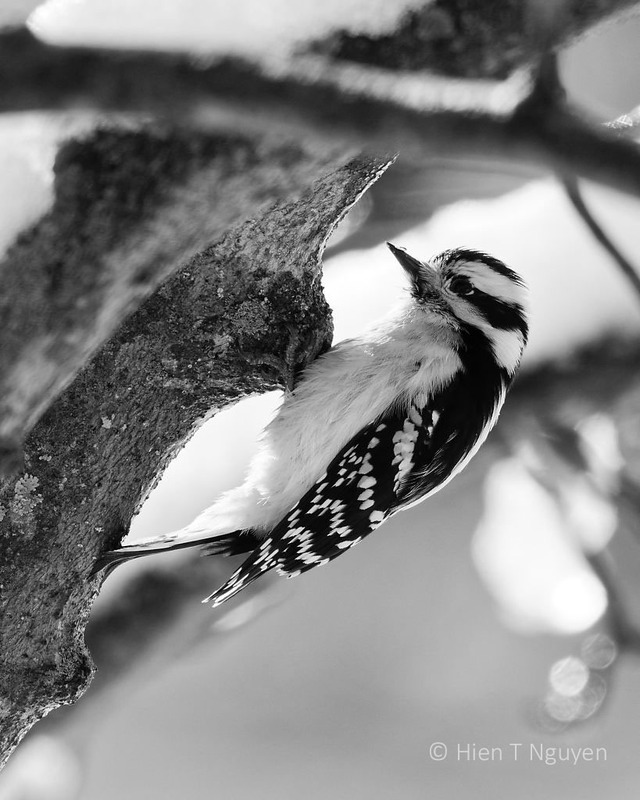 A stunner in black&white – great work, Hien! Beautiful in B&W. Lovely woodpecker. That must have a shed load of snow if it broke tree branches! Lovely photo. The combination of wet snow and wind broke many small branches. When it gets warmer, I will have to go out and do some cleanup. Stunning in black and white! Beautiful. The texture and detail is wonderful. Love downy woodpeckers. Nice shot! She held still long enough for me to take the shot, and some others as well.